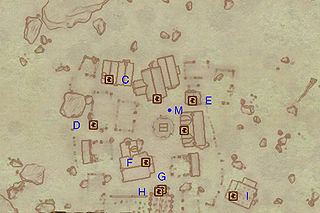 Hackdirt is a village with an inn between Chorrol and Skingrad (quest-related). Hackdirt is a small mining village founded by Vlanhonder Moslin's grandfather, Irlav. The town's residents turned to worshipping the "Deep Ones" they encountered in their mines, but the cult's activities apparently got out of hand, with travelers being murdered, and the village was burned to the ground by the Imperial Legion in the ensuing hostilities. Its citizens took this as oppression by the "outsiders" and have since rebuilt part of the town, though its new buildings are still surrounded by burnt-out rubble. They are notoriously intolerant of outsiders, so much so that some will become downright hostile with the right provocation. It appears that their shifty activities have not ceased, as the daughter of a prominent merchant in Chorrol has gone missing while making a delivery to the town. Services in the village consist of an inn and a shop. Underneath the town there are some caverns accessed through trapdoors. Two of the trapdoors are outside, but five more trapdoors are located inside the town's buildings. The Chapel of the Brethren can be found in the southern part of town and contains the Bible of the Deep Ones. Esta página foi modificada pela última vez à(s) 16h50min de 30 de junho de 2015.